Amelia Rose Earhart is recreating the historic last journey of her world famous namesake, Amelia Earhart, this June with a solo flight around the world. Travelling some 28,000 miles and stopping in 14 countries, Amelia Rose will remain fully connected to the outside world throughout the journey thanks to Satcom1 and Inmarsat, the world’s leading provider of satellite communication services to the aviation industry. 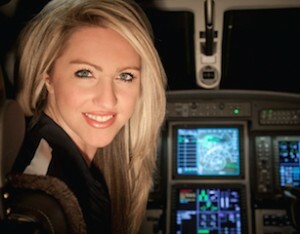 Amelia Rose will fly a Pilatus PC12-NG, single engine aircraft, equipped with the latest avionics technology from Honeywell Aerospace, including satellite communications, as she recreates the infamous 1937 journey by Amelia Earhart that ended in her disappearance over the Pacific Ocean. Inmarsat’s satellite connectivity service, provided in partnership with Satcom1 for airtime, airborne network design and consultancy services, will allow data to be streamed live along the entire route, enabling Amelia Rose to stay in touch with her team and supporters on the ground. Amelia Rose will be able to stream live video during the flight via optimised video transmission technology. Social media will also play a major role in helping Amelia Rose’s supporters follow her progress, and interact with her during the flight. Throughout the journey, they will be able to ask questions and engage with Amelia Rose via Facebook and Twitter using the hashtag #flywithamelia. Inmarsat’s global satellite coverage will enable Amelia to use social media all over the world, during every stage of her flight. The Fly With Amelia Foundation was started by Amelia in 2013. The non-profit organization provides flight training scholarships for young women, builds STEM1 based educational curriculum and engages people of all ages and backgrounds in the thrill of discovering their own adventures. The Fly With Amelia Foundation works in partnership with Wings Over the Rockies Air and Space Museum to connect the community with the general aviation world. “Satcom1 believe this journey will bring new connectivity requests from younger pilots and private operators, who will realise how simple it is today to work on-board, operate the aircraft or just have fun via satcom connection. We know that the Fly With Amelia Foundation supports young ambitious kids and they are the future users of these technologies and will be using more apps and more data content than ever before. It is an exciting era within communication and Satcom1 wish Amelia and all the kids who she inspires to follow this wonderful journey online.” – states Karina Larsen, Co-founder of Satcom1.